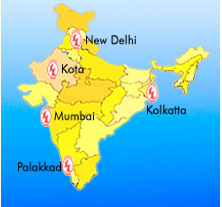 Instrumentation Limited, Palakkad (ILP) started in 1974 as the second manufacturing unit of IL, Kota. It started operations in collaboration with M/s Yamatake Honeywell co.Ltd., Japan (YH) the world renowed leader in process control instrumentation including final control elements like control valves etc. In India, ILP has achieved self reliance in the field of Instrumentation and has gone on to earn a fair name as a leader in providing turnkey Instrumentation, not only to the core Indian industry, but also to the overseas market. Today, Instrumentation Ltd., plays a vital support role for a very wide spectrum of industrial enterprises  ranging from core sector establishments such as steel, power, cement and oil refineries to large medium and even small scale industries. Manufacturers and exporters of control, butterfly, globe, safety relief, bellows sealed, engineering, angle, high pressure valves and actuator, instrumentation, transmitter, desuper heater, power cylinder, orifice, cavitation and positioner. ILP supplied its largest ever control valve, 30 inch size Antisurge control valve, to M/s BHEL, against their prestigious order for MRPL project. The unit in Palakkad is under expansion to handle bigger and critical valves weighing up to 25 tonnes. During the 2009-10 fiscal, the unit has manufactured and supplied 2,800 mm size butterfly valves for the Vizag Steel Plant and 24 inch control valves for Pragathi 660 MW Power Plant in New Delhi. To get the details about the available tenders, Please click on the above link Tender. Kanjikode West, Palakkad, Kerala - 678 623.